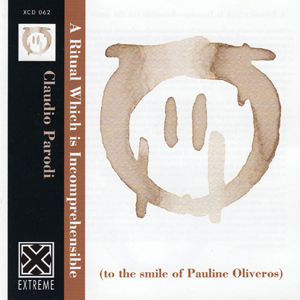 “The Mother of All Feedback” reveals a side of CLAUDIO PARODI that is normally only heard at his live concerts. In addition, it shows a musician with incredible improvising ability who can manage to drag everything, kicking and screaming, out of his “Mother”. The “Mother” is of course the name of his archaic feedback device, an instrument that has weathered the tests of time and touring and still keeps giving of its tortured sounds. PARODI knows the “Mother” better than any of the many instruments he plays and from this comes a wonderful sonic vocabulary to express so many emotions. The album starts with a studio session, ‘A Room’, which captures all of the nuances of this versatile cheap electronic instrument. In keeping with PARODI’s wonderful sense of humor, the titles reflect a day in his life. ‘Outside a Locked Door’ is recorded live in a Genovese Club. PARODI delivers an intense and personal musical outpouring. ‘Feedback’, a different instrument affectionately known as the ‘son’ of the ‘Mother’, was really giving its all to an appreciative audience. PARODI concludes with ‘L’Assedio’, a study about building the space and the feeling of a medieval siege. It is a wonderful example of improvisation and overdubbing, where a single musician can create a wonderful wall of music. PARODI manipulates the four recording takes for ‘L’Assedio’ in real time. This piece sits up there with the best of noise musicians such as Merzbow and displays so many layers and harmonic interactions. It also shows PARODI taking further risks with his musical improvisation, allowing the sound engineer to further manipulate the performance. “The Mother of All Feedback” is PARODI quite literally kicking out the jams. He is having fun and exploring all sonic corners of feedback from his cheap electronics. Turn it up and enjoy the ride!